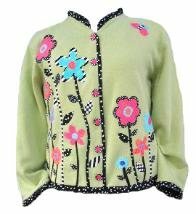 KIT includes pattern, 6 handmade buttons, and similar fabric selection for the applique designs, ruffle trim and binding. It does not include a sweatshirt or notions. BUTTONS are handmade, bright pink with black and white edges.